Riverside is a beautiful little community with strong family values and—no surprise here—a cute little river running through it. And it’s also home to a Summit family. The Foleys, who have lived in the Riverside community for the last 12 years, have been consistently praying that they would be able to be a light in their community. Naomi, her husband, and their four daughters have been praying that they would be able to be the hands and feet of Jesus to their friends, their neighbors, the kids in their classes...those they feel God has put in their lives for a unique purpose. “We realized that, after all these years, there were people who live just down the street that we still didn’t really know well,” Naomi explains. And that didn’t sit well with the Foleys—these were people who had unique stories, skills, purposes, and, most of all, they were people who were greatly loved by God. And so, week after week, as the Foleys prayed for their community, they invited their church into that heart-felt prayer alongside them. This year, however, the prayers of a faithful church have gotten the chance to become actions alongside this family. 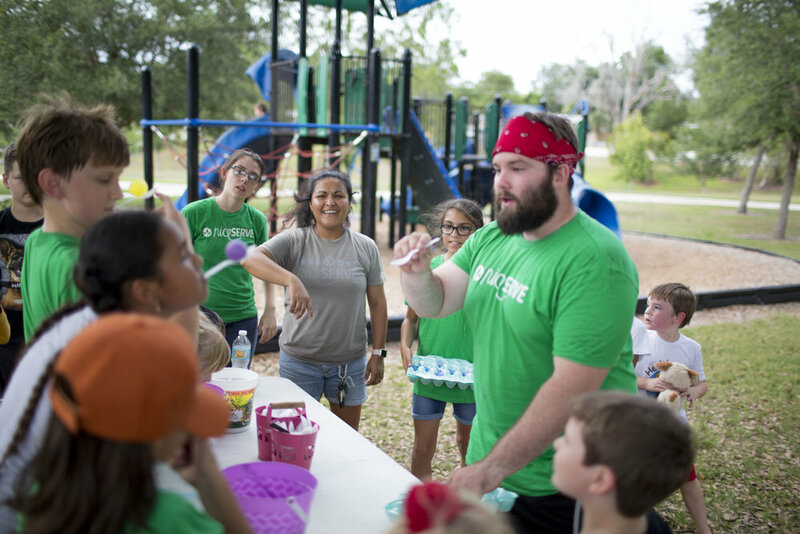 Since niceSERVE expanded to a week-long event last spring, the Lake Mary Campus has been able to include serving the Riverside community as one of their niceSERVE projects. “It was really great to be able to join in something we’ve all been praying for for so long.” describes Lake Mary Ministry Coordinator Amy Kaufholz, who helped Naomi translate her idea into a niceSERVE project in the spring. This first project was held on a Friday afternoon near the Foley’s home and focused on getting to know the community through simple acts of kindness. The Foley family, along with their niceSERVE crew, were able to create new relationships that have only grown over the last several months. Friendships have been forged across the family and Naomi has had the opportunity to step into volunteer leadership roles in the community as well. And as those relationships have grown, so has the opportunity to deepen and expand their reach in their community. This upcoming niceSERVE, many from the Lake Mary Campus will be joining the Foley family again as they have been invited to help serve in the community’s Fall Festival. Though we can often see some exciting fruits of our labor during niceSERVE, like a freshly painted school bus or an exquisitely organized food pantry, when all is said and done it’s the relationships formed through our service that carry the real weight. When I think of all of the Monday mornings spent lifting up this family’s Sunday prayer request, I can’t help but celebrate each new opportunity to serve and build on those relationships. Opportunities that demonstrate to this community a fact that’s always been true but has been so clearly recognized specifically by one family— they matter. Behind each and every niceSERVE project, there is a story of a relationship. There is a story of someone somewhere recognizing and taking ownership of a community and recognizing that they too matter deeply to God. niceSERVE 32 is right around the corner and we would love to have you be a part of it! There are still plenty of projects open, plenty of opportunities to communicate through your actions that Jesus cares deeply about those in our community. Sign up here!